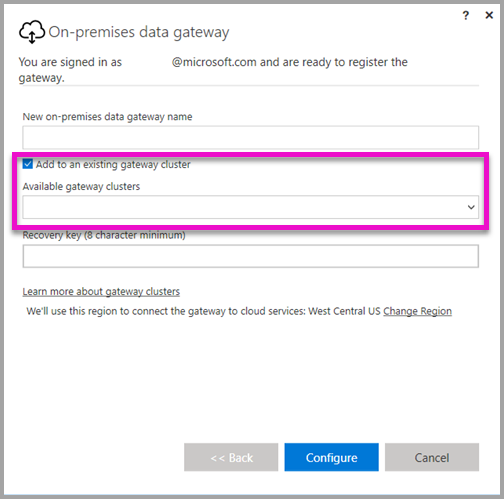 Today, you can create high available clusters of on-premises data gateways, to ensure your organization can access on-premises data resources used in PowerApps and Flow. Such clusters allow gateway administrators to group gateways to avoid single points of failure in accessing on-premises data resources. This article describes the steps you can take to create a high availability cluster of on-premises data gateways and shares best practices when setting them up. High availability gateway clusters require the November 2017 update to on-premises data gateway, or later. During the on-premises data gateway installation process, you can specify whether the gateway should be added to an existing gateway cluster by selecting the checkbox ‘Add to an existing gateway cluster’. To add a gateway to an existing cluster, you must provide the Recovery key for the primary gateway instance for the cluster you want the new gateway to join. The primary gateway for the cluster must be running the gateway update from November 2017 or later. Once a gateway cluster consists of two or more gateways, all gateway management operations, such as adding a data source or granting administrative permissions to a gateway, apply to all gateways that are part of the cluster. From PowerApps or Flow, you will only see the individual gateways. If the gateways belong to a cluster, you will only see the primary gateway (also known as anchor gateway) but won’t see other gateways in the same cluster. You will not see the cluster the gateways belong to from PowerApps or Flow neither. We are improvement this experience soon. In the meantime, there are available PowerShell commands you can leverage to manage your gateway clusters, see the link below for a complete list of PowerShell commands. So, how can you leverage high available clusters of on-premises data gateways for PowerApps and Flow? Say you have a cluster created with two gateways, a primary and a secondary one. 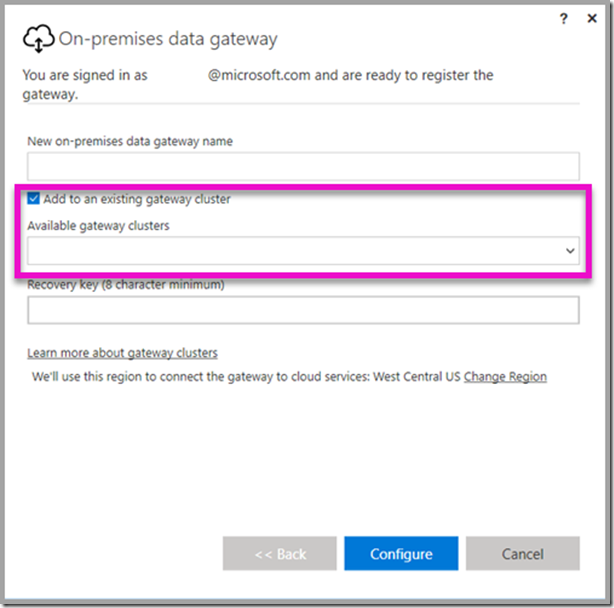 If your primary gateway is down, you can still create a connection through your on-premises data gateways in PowerApps and Flow. Even though you select the primary gateway name from the UI, it will work and technically leverage the secondary gateway in the backend. We are working to improve this management experience soon. Please refer to this article for a list of PowerShell commands to manage your gateway clusters.